So I actually completed these ages ago, but they were surprise gifts for some friends who I had yet to see so couldn’t put them online until now. They were ‘trials’ of a technique that I’ve never used before, as I’ve only ever needle-felted. It involves nothing more than cutting shapes out and stitching/gluing them on to each other, not tricky but different to me. I think they turned out okay though with only a few blips. I realised by cutting the felt you end up with this sort of felt dust that was really noticing on contrasting colours, so I had to use pieces of cello-tape to clean up. I also found out the thickness of felt I’m using (quite thin) means I can’t really achieve ‘sharp’ corners without them turning fluffy at the ends. As you can see on Jake’s muzzle (the yellow one) I have a weird fold where I sort of fell of his eye but had to keep stitching anyway. But hey, it’s a learning process! All the nerds out there will know exactly who they are, but just in case you aren’t sure on the top left felt hoop we have ‘No Face’ from ‘Sprited Away’ and the right is ‘San’ from ‘Princess Mononoke’, both Studio Ghibli films. 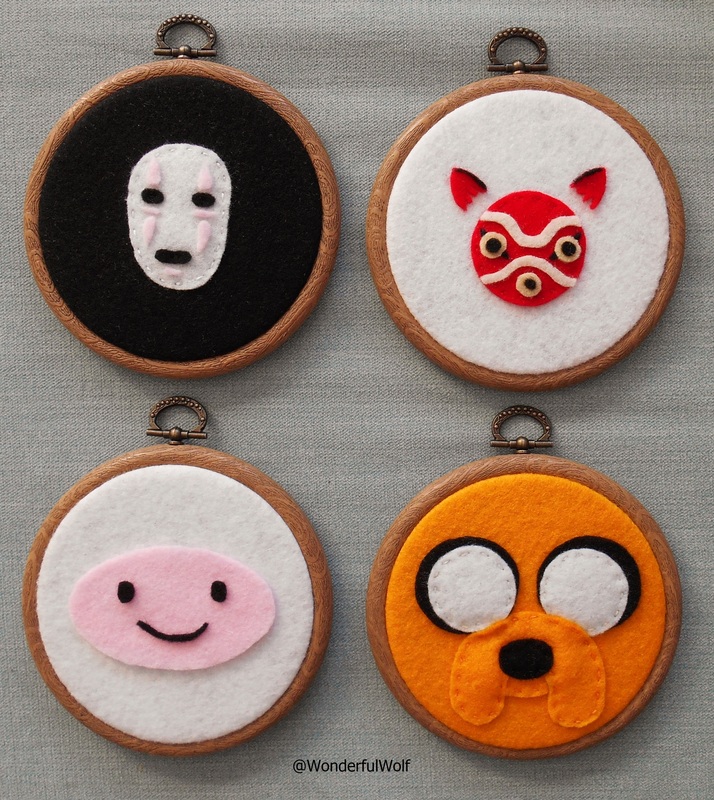 On the bottom left felt hoop we have; ‘Finn the Human’ and the right is ‘Jake the Dog’ from ‘Adventure Time’.